This is the best homemade tomato sauce I’ve ever made and maybe yours too. Homemade tomato sauce is one of those staple recipes we should all have bookmarked, dog-eared in a cookbook, pinned on board, or memorized so you can whip it up with pantry staples. Just like hummus, soups, plant milk, smoothies, and salad dressings, it’s great to have the go-to recipes you can rely on and that you trust will always taste great. I memorized this recipe so it feels like second nature when I’m craving a week full of pasta sauce to use on roasted vegetables, with fish, or tofu, and of course with pasta. This is a recipe you make on the weekend or on a day where you have more space and freedom to relax around the house because of the cook time. I know this recipe says it takes 4 hours to cook, but I promise the cook time will make up for the flavor. It takes about 4 hours to get the best result in flavor and texture, but you can extend it to 6 hours if you really love a thicker sauce and one that’s strong in flavor. I found that 4 hours is the sweet spot for our flavor and texture preference but try it out to see what works best for you. Another fabulous thing about this homemade tomato sauce is the leftover-factor. It makes leftovers to last you (and the whole family) meals for the entire week or if you’re cooking for yourself be sure to save half and put it in the freezer for later. One frequent questions or topics of discussion with clients is “can I eat pasta?”. Yes, yes you can eat pasta! 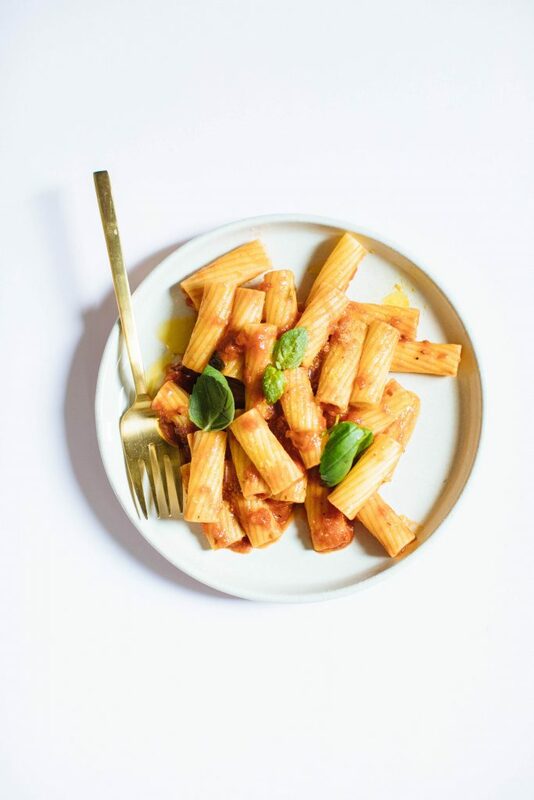 First up, if you have a known food intolerance or sensitivity to gluten or wheat then try kinds of pasta made with gluten-free grains or legumes — there are plenty on the market to choose from. Just remember, consuming a gluten-free pasta just because you think you “should” or “need to” based on media or marketing isn’t true. Pasta made with whole organic wheat (or added bonus if it’s homemade) can be a good fit for your lifestyle. Something to keep in mind if you’re looking for the more nutritionally-dense option is to give gluten-free and legume-based pasta a try. Most of the newer legume-based or gluten-free kinds of pasta have significantly more fiber and more plant-based protein which is a great addition to an otherwise carbohydrate-dense pasta. Another thing to keep in mind is the context in which how often and how much pasta you eat during the week. Whole food carbohydrates that are closest to nature are always the best option — they typically contain more fiber. Lycopene, a carotenoid, the most notable and highly studied antioxidant when it comes to tomatoes. The compounds in tomatoes, lycopene, in particular, have been linked to helping fight a variety of cancers (1), help improves circulation, decrease high blood pressure (2), reduce cholesterol (3), reduces cardiovascular risk (4), and reduction in metabolism syndrome (5). Antioxidants: We’ve chatted about antioxidants a lot here on NS, but in a nutshell, our bodies need antioxidants to fight off free radicals. Free radicals can damage our healthy cells causing oxidative stress, which may cause harm to our hormones, blood vessels, proteins, lipids, and genetic code; causing cancer, inflammation, pain, degenerative diseases, heart disease, and aging itself. The olive oil used in the recipe is a must-have! Healthy fat like olive oil helps your body absorb and soak up all those fat-soluble vitamins and carotenoids (like lycopene). Also, cooking helps increase lycopene absorption. You can boost the nutrients by adding toasted pine nuts, fresh basil, or if you enjoy cheese you can add that here as well. I use Kite Hill Foods non-dairy cheese and it’s delicious!